Analyzing patterns of public attention in Ukraine with data from Google. Patterns, charts, statistics and some irritating results. The armed conflict and institutional reforms are core issues of Ukrainian politics which dominate the public discourse over the country’s future. The public attention sways back and forth between both issues, this pattern has been clearly observable over the past months. Let’s consider this as a thesis and let’s try to test it systematically against empirical data. An interesting method of measuring trends in public attention is to analyze people’s search queries in Google. If people google ‘Manchester United’ this week three times more than last week, it’s an indication that the public attention of Manchester United has increased. The method doesn’t allow to conclude about personal interests of individuals, but it is appropriate to make conclusions about trends in society. The low precision of the operationalization is compensated by a mighty quantity of data points. And it’s almost in real time. Google Trends provides data on such trends, a ‘search volume index’ quantifies the ‘search interest’ of people who use the search-engine. It allows comparisons between the popularity of often used key words and changes over time. The time series below visualize the popularity of search terms related to reforms over the past two years. Data is limited to users of Ukraine, on a weekly base, including Crimea and separatist controlled territories, terms are in Russian and Ukrainian language. The time series enables a visual test of the thesis whether public attention is shifting between conflict and reforms. A first glance seems to support the assumption, peaks in conflict are contrasted by lows of reforms and the other way round. Visualizations like this can be misleading, statistical tests give more clarity. Testing for correlations allows to draw conclusions about similarities between variables – in very simple terms. The correlation (data of 2014 till now) between the both variables (conflict, reform) is negative as expected (r= -0.363). The more conflict, the less reforms and the other way round. In a next step we test the significance of the dependency, this tells whether the dependency is random. A single factor ANOVA indicates a high significance, the probability that the dependency is random is way below 1% (p= 1.180 e-07). So far results confirm the thesis about public attention between conflict and reforms. To be precise the tests allow to falsify the assumption that the thesis is wrong. Let’s go one step further. Maybe one of the variables is able to predict the other one. Regression analyzes are useful in this respect. Imagine data points of both variables are plotted against each other, the wider the distance between them, the lower the dependency, the closer data points, the better the model. In this analysis the sum of all squared distances between data points is calculated. Model I fits best, which rejects the assumption on time dependencies. 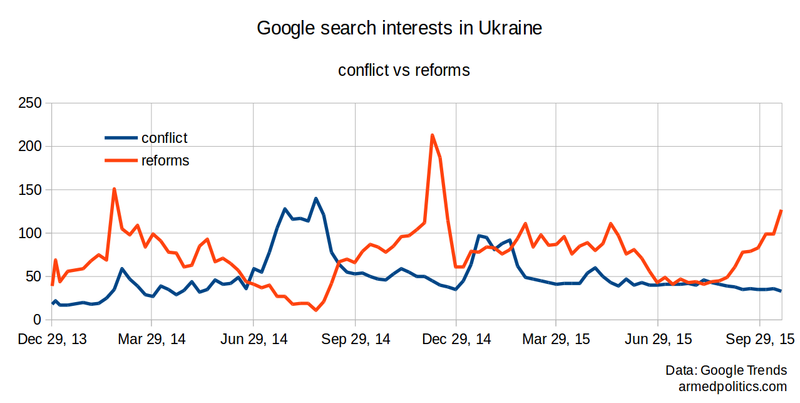 In other words, this week’s searches related to conflict predict this week’s searches on reforms best. It’s a bit surprising that model III fits better than model II, indicating that searches related to reforms of last week predict this week’s searches on conflict better than the other way round. Since you have been reading until here, you might be able to do your own interpretation of these results. Keep in mind that correlations are no proof for causalities and that we are dealing only with data from Google searches. From a methodology point of view we can only reject the assumption that a thesis is wrong, this is no proof whether it is right. Nevertheless, further research in this field seems quite interesting. Various commentators repeatedly expressed concerns that political elites use the war as an excuse or even justification for the lack of reforms. It’s speculation that elites push the war topic as soon as public attention for reforms is rising to levels which would threaten the elite’s privileges. Considering the results, there is no base to reject this assumption either. Further (and more professional) research needed – as usual.